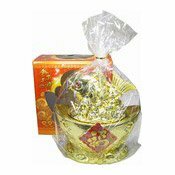 Description: Pretty golden fish candy box for Chinese New Year to fill with candies of your choice. Made of plastic, the fish sits on a golden ingot, and when opened, the candy box has a red lacquer-effect inside. Simply enter your details below and we will send you an e-mail when “Golden Fish New Year Candy Box (年年有魚糖果盒)” is back in stock!